Recently, I was entrusted with some old family photos. Some I had seen before, but many I hadn’t. Some had names written on the back, but many didn’t. It’s amazing how much hope you can feel in the fraction of a second it takes to turn over a picture. I didn’t need to look on the back of this one. 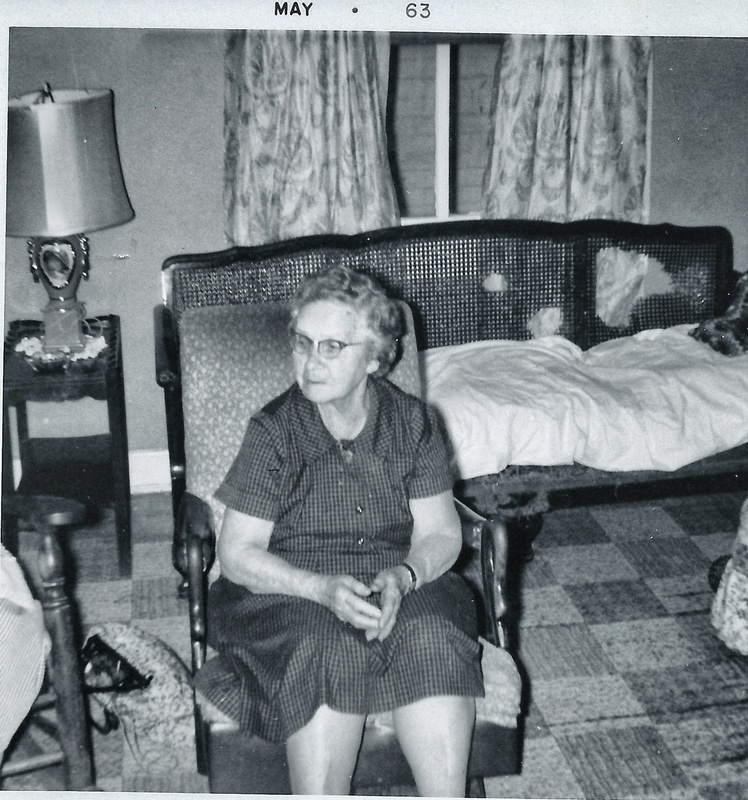 This was my maternal grandmother, the only grandparent I knew. The others had passed away before I was born, but Grandma was in my life until I was 16. According to the date on this picture, I would have been just a young child when it was taken. Grandma lived only about a quarter mile from Mom and me. Since my dad had died when I was an infant, and my sisters were grown and married when I was very young, Mom and I visited Grandma every day. The school bus driver (a family friend and neighbor) knew to stop there in the afternoons if she saw Mom’s car. When I found this picture, I immediately glanced around at the furnishings in the room. I don’t recall that (badly in need of repair) caned-back sofa. The one I remember had both back and seat cushions, which never stayed in place when you sat on them. There’s a crocheted afghan (one I’m sure she made) on the sofa at the far right corner of the picture. But, oh how I remember that goose-neck rocker of Grandma’s. She rocked many a grandchild and great grandchild in that rocker. And sat in it in the afternoons as she (and usually my mom) watched soap operas. (Always the ones on CBS: As The World Turns, The Guiding Light, The Secret Storm and The Edge of Night. It would have been unheard of to watch another channel.) It was also unheard of for anyone else to sit in Grandma’s chair. I found myself wondering which of my relatives took this picture. Did Grandma not realize she was being photographed? I have other pictures of her, where she’s looking at the camera, so I don’t think she was looking away intentionally. Wonder who or what had her attention at this moment. Of course, there’s no way I can know who took the picture, but I’m so glad they did.